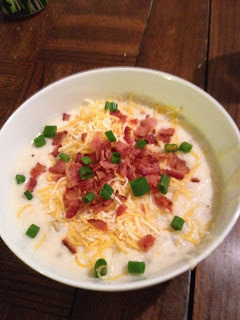 Loving my crock pot and quick fix meals on this crazy busy week! Hope you have a great week! I'd love to know what you are cooking up this week! 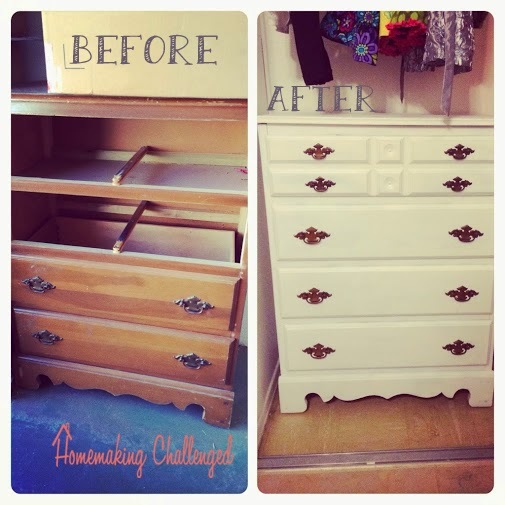 The time has come to officially announce the winner of Homemaking Challenged very first giveaway! Congratulations Courtney B!!! As the rules state you have 48 hours to contact me via email to claim your prize, or another winner will be selected. Thanks for joining in the fun! I am hoping to do another giveaway soon! I am blessed to have a father who is a contractor and can help us do the millions of projects we have to do in this house. 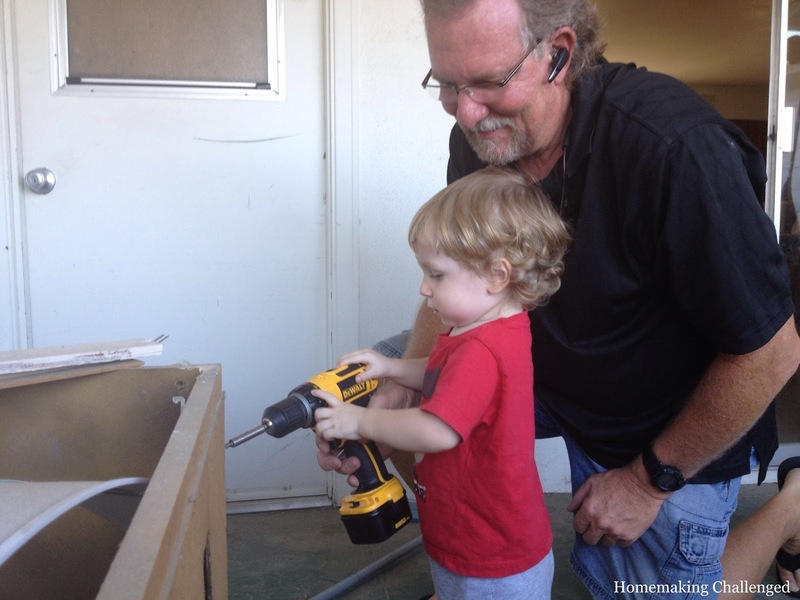 I am extra blessed that my son, LOVES his grandpa. My dad came over to take some measurements to install our dishwasher, and hang some new smoke alarms, of course my sweet boy had to help! Honestly, I just wanted to share the cute pics of my son playing with tools and my dad. Makes my heart happy. The future site of our dishwasher! PS Today is the LAST DAY to enter the giveaway! Make sure you do it! This has always been one of my favorite recipes growing up. It is really yummy and SUPER easy to make. It works great as a "nicer dinner" but is also easy enough for every day. You can make more easily for a large group as well. It's great! As always the full recipe is at the bottom to make it easy on you. Here is a picture of the ingredients, just 4 things! That's it! Combine the Catalina, onion dip mix, and whole berry cranberry sauce in a bowl. Serve with a delicious side, such as rice-a-roni and a salad and ENJOY! It is a great and easy chicken dish. It also makes GREAT leftovers, I always make extra. One of my favorite things about this, is we buy frozen chicken tenders at Costco, and for this recipe we don't even have to defrost them! 1 Can whole cranberry sauce. Mix ingredients into a large bowl, add chicken and cover completely. Dump into a 9x13 pan and cook at 400 degrees for 45 - 60 minutes. PS Don't forget! There is still time to enter the giveaway which ends 9/21! Tips to help you survive traveling with your toddler. No matter how you will be traveling, going anywhere with an active toddler can try anyones patients. This summer we had ours sit through multiple car rides, and even a 4 1/2 hour plane ride. 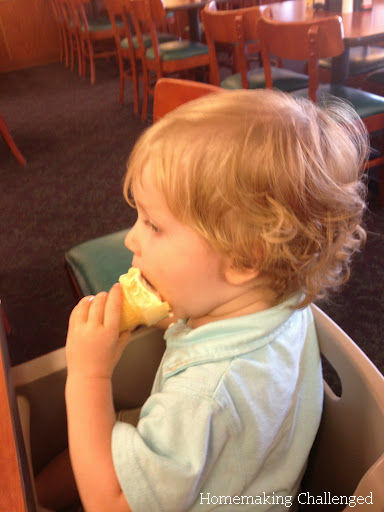 He did them all like a champ and here are the tips I have learned for traveling with a toddler. Sounds obvious I know, but if you keep a routine, try and stick with it. If it is nap time, try and have them take a nap in their car seat. Try to schedule your travels around their schedule. When we know we are going to be taking a two hour drive, we do it during nap time, and let him sleep in the car. Sometimes, we wait until night time to leave. We get him ready for bed and then "put him to bed" in the car and drive. Sometimes, you just can't arrange your schedule, and that is OK too, just know you will need to keep them entertained. My son ate up the iPhone (something he rarely gets to play with), movies on the laptop and lots of music. FYI they MAKE toddler friendly headphones, I picked some up at Toys R Us before my big boy's 1st flight. They didn't last super long, but made a great distraction. Again common sense, but honestly make sure you have what you need. Do not forget their noise machine that they use to sleep with every night, (I only did this once). Or their favorite toy, book etc. Make sure you have what you need for where you are going. Also, snacks and plenty of toys, or books they haven't seen yet. However, do not over pack! The last thing you want to be doing is lugging extra stuff when chasing your toddler, or rummaging through useless stuff to find the item you need. 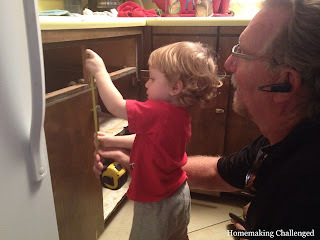 There is a good balance that you must find for your toddler and your sanity. Bottom line, take what you need, a few extras just incase and leave the rest. Honestly, my toddler did AMAZING traveling this summer. We found what worked for us and went for it. Even when he didn't sleep in the car, like he was supposed to, he was still in good humor and did well. I am so thankful to not have a toddler who screams the entire time. He even grabbed his sister's hand. Normally they don't sit next to each other in our car, however this was the best configuration in my grandma's car, and he melted my heart. They are more resilient and flexible than you know. Enjoy your travels, be silly and make memories! 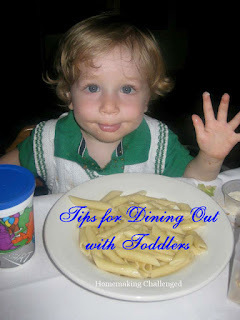 I hope that you are enjoying my Tips for Toddler's series, so far we have done Tips for Dining out with Toddlers, and Tips for Moving with Toddlers. Next week, Tips for Staying Home with Toddlers. Here is what we are planing on eating this week. I have to say, I totally love planning things for the week and then adjusting the days later! It's awesome. What are you eating this week? I have been dying to share this recipe with you for a long time, and that time is finally here. This has been a family favorite of ours for years. I have made this recipe so many times it is memorized. Here is a walk through of making it, followed by the full recipe and ingredient list at the end for those who like to copy and paste. I apologize in advance for any weight gain you may incur due to these brownies, but please enjoy them. Here are the ingredients, just 5 things! Empty the German Chocolate cake mix into a mixing bowl and combine the melted butter and 1/3 cup of condensed milk. It will mix into a wonderful gooey chocolate batter, it will be thick and tacky (not like regular mix). Divide the bater in half and press one half into the bottom of a 9''x13'' pan. Bake for 8 minutes. Set the remaining half of the batter aside. While it is baking combine the carmel and 1/3 cup evaporated milk and melt them together. Remember to melt slowly so as not to burn the caramel. Then poor the melted caramel mixture onto the baked brownie. 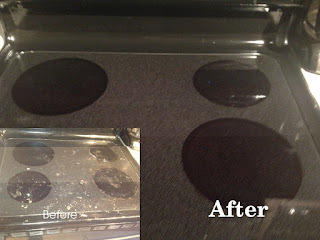 Spread out the caramel so it covers the entire brownie, be careful to not pull the brownie apart, it is still soft baked. Then top with chocolate chips, cover evenly. Finally, take the 2nd half of the batter, and crumble it over the entire brownie. It will still be sticky, but evenly cover with the remaining batter, there will be some gaps. Allow to cool and then cut and enjoy! This is one of my favorite desserts, and I'm so excited to share it with you. Below is the full recipe for you in one place. I hope that you enjoy! Preheat oven to 350. Combine cake mix, butter and 1/3 cup evaporated milk. Divide batter in half press one half into the bottom of an un greased 9'' x 13'' glass pan, bake for 8 minutes. Set other half aside. Melt caramel and 1/3 evaporated milk, poor evenly over baked mixture and sprinkle chocolate chips over entire pan. Crumble remaining half of batter over the entire and bake for 10-12 minutes. Allow to cool, then cut and enjoy! *Usually I purchase the Kraft individually wrapped caramels, but occasionally they have caramel bits, which work as well and I used this time. PS If you found me via a link party WELCOME! I am currently hosting a giveaway (ends 9/21), I'd love for you to enter. I love to link party, I'm linking up with these great parties this week. THIS GIVEAWAY HAS ENDED THANKS FOR YOUR PARTICIPATION! Today, I am hosting my very first giveaway! I'm so excited!!! Every homemaker (and person) needs a little treat and a break sometimes. So today I am giving you an opportunity to win a $15 Starbucks card! I am in no way affiliated with Starbucks, but I love meeting friends for coffee there. Who wouldn't like a free $15 gift card? Even if you don't like Starbucks, you can regift it (promise I wont tell). 1) Follow or Subscribe to my blog and leave me a comment letting me know that you do. That means you have up to 5 chances to win!!! 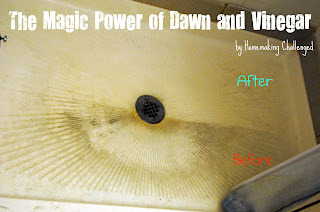 Contest ends Friday, 9/21/12 at 11:59pm and the winner will be announced on my blog on Saturday 9/22 and will have 48 hours to contact me via email to claim their prize. Please know that by entering you acknowledge the terms and conditions. So get busy and start getting some entries! Say no, to watered down beverages, just freeze whatever beverage you enjoy into an ice tray, then add it to your beverage for a cold drink that doesn't get watered down as the ice melts! My husband is a HUGE Mt Dew fan. He loves his Dew, so much so, that he can't stand it being deluded by regular ice so he freezes Mt Dew in ice cubes for some extra cold, extra refreshing Mountain Dew. It is very easy, just freeze some Mountain Dew in an ice tray, place the Mountain Dew ice cubes in your drink, and enjoy! This fantastic tip, will not just work with Mountain Dew, but any other beverage! No more watered down beverages during the hot summer months. Enjoy! Warning: This is far cry from my normal type of post, so I sincerely apologize to my readers. You have my full permission to skip reading this post. I will resume my home bloging tomorrow. 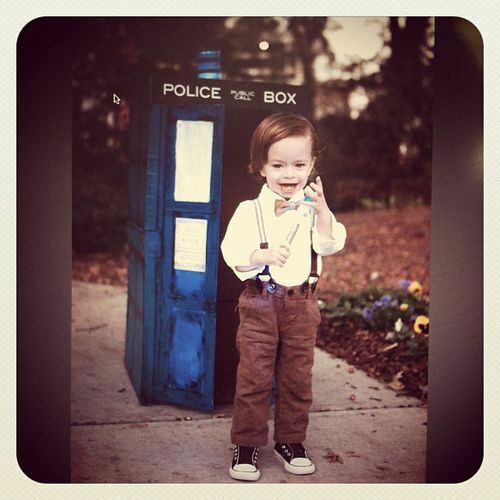 Well since baby girl will be in the stroller for the evening, we figured she/the stroller can be the TARDIS, and little man can be The Doctor. However, the fun doesn't stop there... 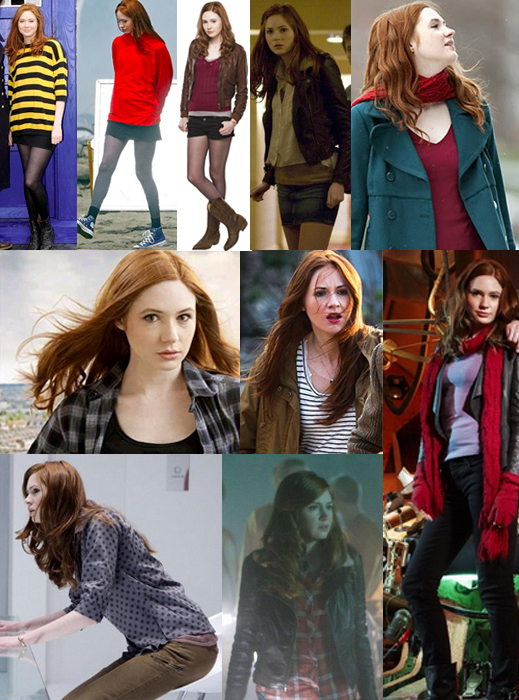 I am going to have hubby and I join the fun by being The Doctor's current companions Rory and Amy. After tons of googling, I think I am going to go for something like this for me, probly closer to the bottom right look. So that is what our family is planning to do for Halloween this year. I am DYING to get going as I know it will take me awhile to find all the pieces to create these outfits, so I'm officially on the hunt because Halloween will be around the corner before we know it! When you are dining with an infant, it is easy. Most of the time they just sit in their infant carrier, sling or are held by you. They will mostly sleep or look around, and behave well. Dining with an active toddler who insists of feeding himself is a whole separate ball game. I asked my hubby what tips I should add, for this posting, and his reply was simple. "DON'T". While this would solve your problem completely, it is not always realistic. So here are the things I have learned about dining out with a toddler! Does the place have highchairs? Booster seats? A Kids Menu? All of these things are important and will also help gauge how family friendly the restaurant is. If they don't have a kids menu, this is a good clue that you may want to choose another option, as they will most likely not be as kid friendly. Also knowing if you need to feed your toddler ahead of time, or not will help so that you don't end up with a hungry toddler before dessert is served. Remember that your child is not an adult, they are a toddler! They have a much shorter attention span and do not understand why they must stay in a chair and be quiet. I often forget this of my own son, and when he does excellent in a situation for a toddler, I think he didn't do so great because I am comparing him to an adult. The internet is full of things like quiet books, free coloring pages, etc. Find some quite activities your child enjoys and then allow them to quietly play while you eat. I have yet to encounter a restaurant that has toddler silverware. My son attempting to eat mac and cheese at Panera with an adult soup spoon, is comical and messy. I always keep a spare set in the diaper bag for just that occasion. Sometimes, they need to get out some energy. Take them outside, let them run a bit and return them to the table. If they are like my son, make sure they know that they need to go back and sit quietly afterwards. If the weather doesn't permit an outside walk, quietly walk them around the inside. Sometimes a change of senary makes all the difference in the world. Toddler meltdowns happen. Be ready to pay and exit quickly should the need arise so that you don't bother fellow diners. Most establishments will be more than happy to box your meal for you and let you pay at the front to allow you to remove your toddler who is being loud. 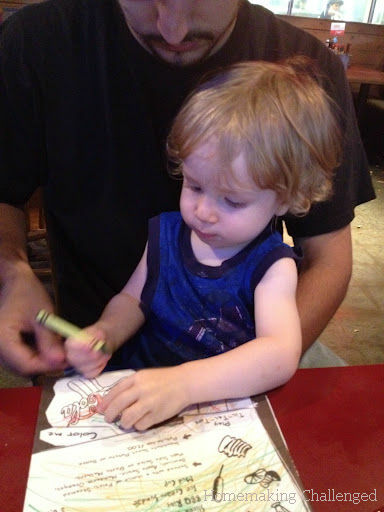 To your server - clean up the mess that your child made as much as possible, and leave a nice tip. To fellow diners - allow them to enjoy their meal. To your child - yelling will not make the situation better, I promise. Always verbally praise your child for behaving well. Give them a high five or an extra hug letting them know you are proud of them. Do not be above bribery! My son has learned that if he behaves well, sometimes he will get a special treat. It may be a packet of fruit snacks, or a cookie, or ice cream. It may be an old tired trick, but it works. You are having a dinner out, enjoy it. Most of the people around you have had children at one point or another, don't stress the entire time about what you think others are thinking about you and your family. Most of the time, they are just enjoying their dinner too. Hope that you enjoyed this weeks edition of Tips for Toddlers! Each Tuesday this month I will be sharing some tips I have learned while living life with my crazy toddler. Last week we did Tips for Moving with Toddlers and next week we will be doing Tips for Traveling with Toddlers. On a personal note, today is my wedding anniversary. We have been married for 3 years, have been blessed with 2 children and just purchased our 1st house. Spring of my freshman year of college I met this guy in class, and would have never guessed that we would end up together in a million years! 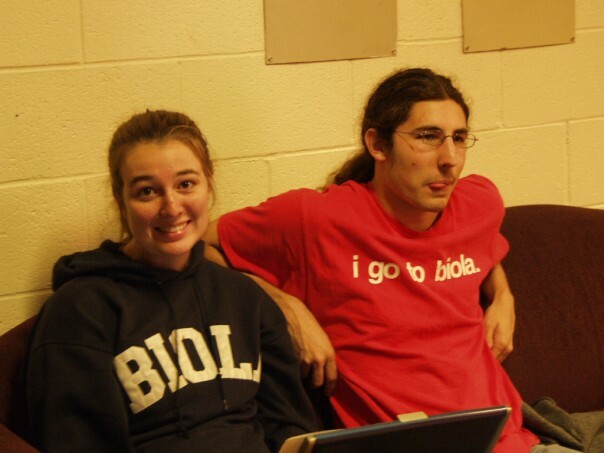 However, God had other plans for us and we started dating in the winter of sophomore year, and were engaged a year later. I couldn't ask for a better partner, best friend, loving father and amazing husband. Love you baby! For your enjoyment, pictures from the past. So yes, my hubby had longer hair than me. and I still said I'd marry him! We are so blessed! Here is to the next 3 years and beyond! 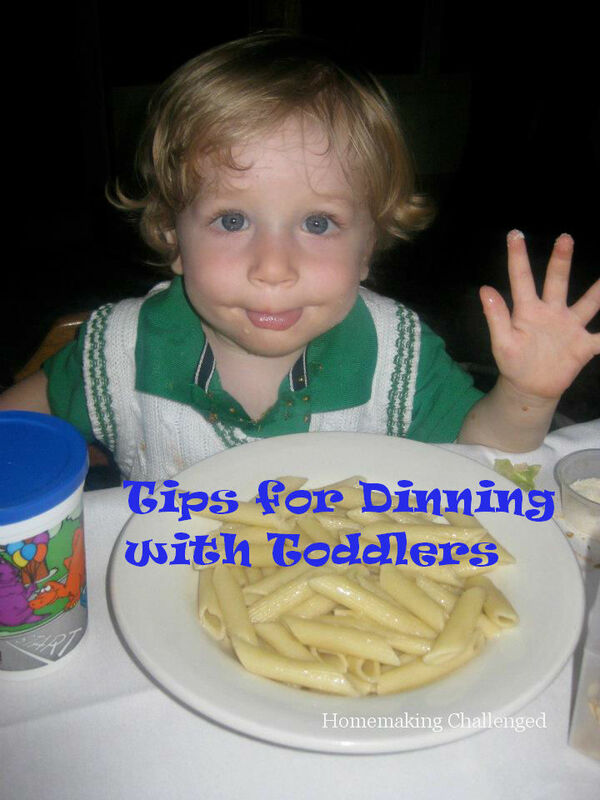 Welcome to Tips for Toddler Tuesdays! Each Tuesday this September, I will be sharing some tips from my personal experience in dealing with my toddler. Enjoy! Moving happens. We can't help it, we need more space, a new job, life happens. For toddlers it can be extra hard for them to understand and explain. 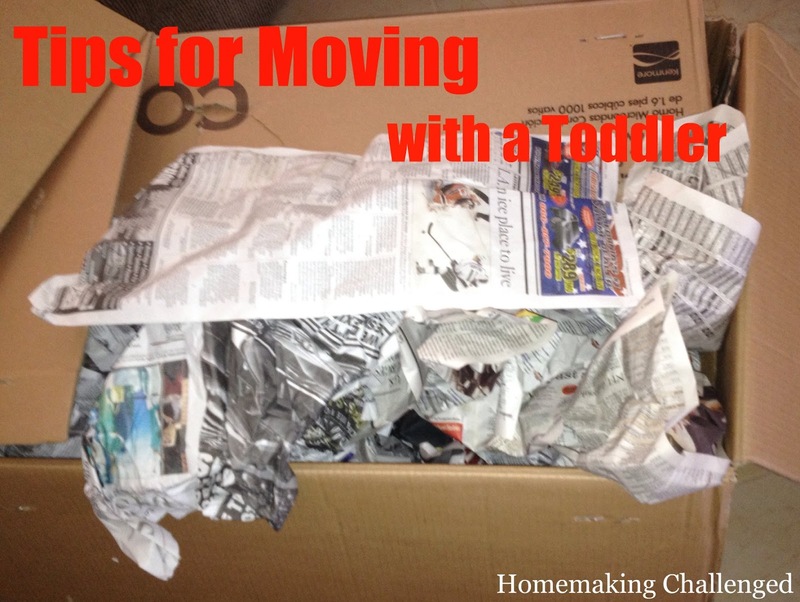 Here are some tips we learned from our recent move with our 18 month old son. This is in no way a comprehensive list, just some tips from my personal experience. Toddlers like knowing what is coming next. If they usually take a nap at 1pm, do everything you can to get them that nap. If they have a favorite morning routine, do what you can to keep them in it as much as possible. This will help them feel more secure while their lives are being turn around. Our son loves cuddle time in the morning with milk, and "pre-breakfast". We made sure he still got this time during our transition. We allowed our son to help pack his toys. He LOVES putting things in boxes, so we made a game of it. We also kept several of his favorite toys and books in an easy to move basket so that he could have something to play with. We also took him to the new house on our walk though and showed him his room, and talked about how he was going to get to sleep in this room soon. There is no way that you will be able to keep your toddler away for long. However making sure they have a safe space in the new house while you are unpacking is essential. My son LOVES to explore and we had to keep him in his room while we were unpacking and trying to get organized so that he didn't find something and hurt himself. They will want to explore, and let them, but not while you are distracted with trying to figure out where to put your dishes. Give them their space, and keep it as close to being the same as possible. Our son LOVED unpacking his toys with us, it was like he was meeting all of his old friends (in our move his toys were packed up for about 3 weeks). Seriously, we let him keep his toys out, and play with them whenever for a few days. I think this helped him realize that they were staying. He loves his room, and actually plays in it BY HIMSELF now! They are going through a lot. Assure them that you are there for them, and that you still have time for them by playing with them one on one extra. Do what they want. Come up with an extra fun activity to do with them. Don't be too busy packing or unpacking and trying to settle in that you allow your toddler to feel neglected. They have so much going on, I know that you will be busy, but make the extra time for them, it will make all the difference in the world. Come back next Tuesday for Tips for Dinning Out with a Toddler! I can not believe that fall is here. The summer flew by so fast, and I can't even see strait right now. I am so excited, this is going to be a big month for my blog. I have new and exciting things coming this month that I want to share with you before I get into my monthly goals. 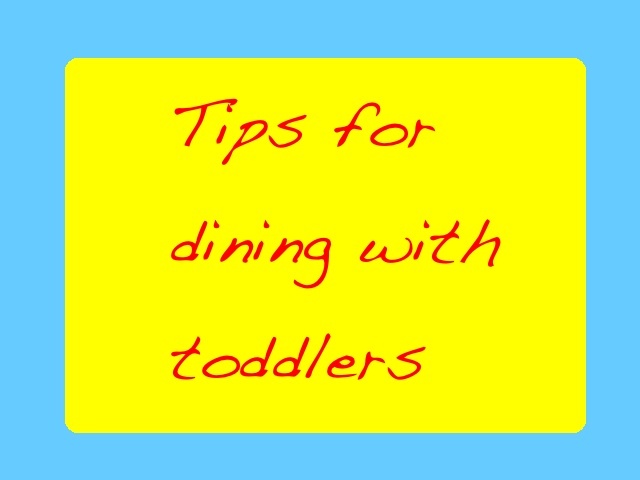 1st, I will be doing a new series on "Tips for Toddlers" each Tuesday of this month. This by no means claim to be an expert, however they are some things I have learned and hope to help others. 2nd, there will be some changes and surprises coming up this month, stay tuned. Now on to my goals for this month. 1) Tame our grocery budget. This month we did pretty well on our grocery spending, but I really think we can do better. 2) Get back on track health and work out wise. My baby will be three months old this month, and it is time for me to get back on the work out wagon. I really hate working out, so I am not at all excited about this, but it needs to happen. 3) Family Focus. This month, I am going to be looking for ways to be more intentional with my family, (and hopefully come up with some tips to share). I want to invest intentional time with my husband and children all the time, but with a focus on it this month. This is going to be so exciting, as I have decided to start my very first link party. I know that I always do better with motivation and people to encourage me. So I'm starting out with our very first monthly goal link party! Here is a place where you can share a monthly goal (or two, or three or more) and encourage others along the way. Lets face it, we could all use some encouragement. 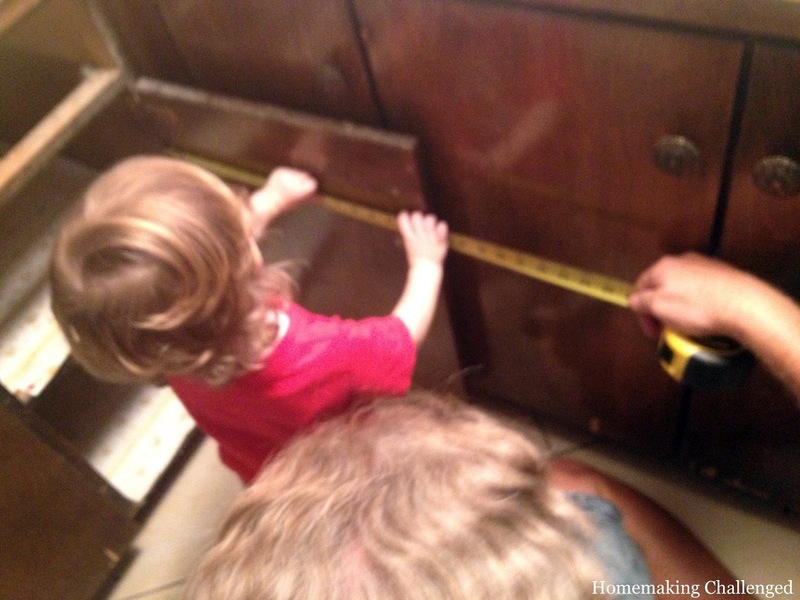 So with out further ado, Homemaking Challenged very 1st link party!